QPR are into the fourth round, with Jack Bidwell's second-half header proving decisive. QPR have reached the FA Cup fourth round for just the third time in the last 17 years after beating Marcelo Bielsa's Championship-leading Leeds United 2-1 at Loftus Road. QPR opened the scoring after 23 minutes as Aramide Oteh struck a penalty down the centre of goal, which was awarded after one of Leeds many youngsters on the day, Leif Davis, took down Jack Bidwell just inside the box. It only took Leeds two minutes to respond, as their equaliser was brought about by a major error from QPR goalkeeper Matt Ingram. A long-range free-kick from Chelsea loanee Lewis Baker forced his spillage, which was gladly pounced upon by defender Aapo Halme - the tap-in was his debut goal for Leeds. Somehow, in an entertaining end-to-end match, it took until the 75th minute for another goal. Bidwell found himself with space at a corner and headed into the top corner, the goal proving to be the winner for QPR. Steve McClaren's men were inches from making it more emphatic when in the 85th minute as Luke Freeman's free-kick was only kept out by the inside of the left post. The first half was full of action, with the vast majority of the play coming down the flanks as both sets of wingers weren't afraid to take on opposing defenders. QPR were lively going forward and were rewarded for their positive play with a place in the next round. Just before their opening goal, QPR had given them a warning as Bright Samuel won a foul on the edge of the box as Aapo Halme received a yellow card. Just a minute later, it was another foul - this time from Davis on Bidwell - a crucial yard further forward, that won their penalty. QPR got into the box on plenty of occasions, drawing a number of half-hearted penalty shouts and forcing Bailey Peacock-Farrell into action. But Leeds dominated possession in the early stages and also could have scored more by the break in an action-packed opening half, looking especially buoyed immediately following the equaliser. The winning goal might have come as the result of another set-piece, but in open-play Rangers were often penetrative and pro-active. 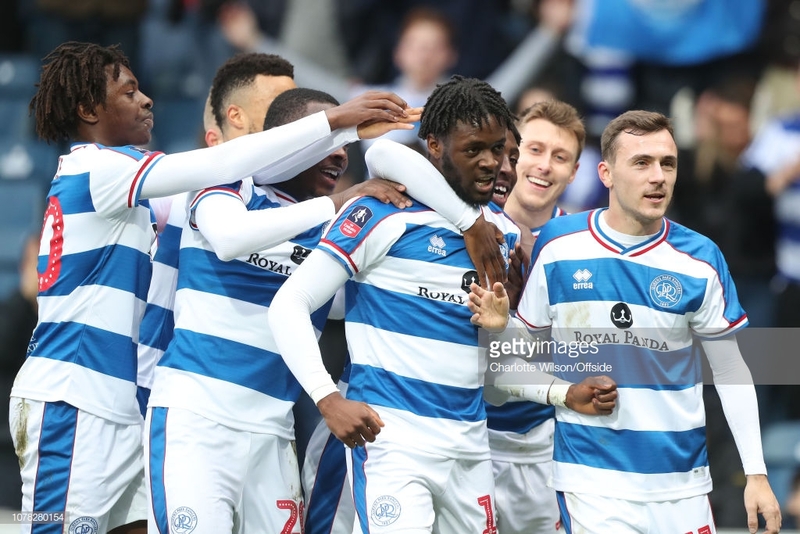 QPR ultimately got what they deserved as they grew into the game, dominating the second half and further peppering Bailey Peacock-Farrell's goal with a number of shots as they forced the under-pressure goalkeeper to make good saves. Of the 22 players that started between these two teams at Elland Road in the league a month ago, only six players remained for this FA Cup clash, with eight changes apiece. Adam Forshaw, Bailey Peacock-Farrell and Ezgjan Alioski all started once again for a Leeds team with an average age of just 22. Jake Bidwell, Luke Freeman and Ebere Eze all remained for QPR. Such changes underlined that both sides view this competition as little more than a sideshow as both sides chase promotion in the Championship. Leeds are top of the table and look to remain there, while QPR will aim to close the four-point gap on the play-off positions. The match itself was played at a good pace, with both sides showing plenty of attacking endeavour to make the next round, and individuals on both sides putting in convincing auditions for more league minutes. Tyler Roberts set a positive tone early for Leeds as his long-range strike hit both posts, while at the other end Davis improved immeasurably after conceding the early penalty. For QPR, Bright Osayi-Samuel was a fearless and enthusiastic presence going forward, if a little imprecise with his passing. Ultimately though, the fun and breezy tone demonstrated that neither side is especially concerned with a cup run this season. Leeds will appreciate the extra rest in an unforgiving promotion push, while Steve McClaren will inevitably rest and rotate once again in the fourth round. As has often been the case this season, Leeds boss Marcelo Bielsa was happy to make some eyebrow-raising changes. Aapo Halme, who had picked up a booking midway through the first half, was brought off at half-time for 20-year-old Tom Pearce. The youngster had looked a little raw but put in a reasonable performance in the second half, in a makeshift backline that didn't feature a natural centre-back in it. Nevertheless, when Leeds went a goal behind, Bielsa saw fit to take him off and bring on forward Kun Temenuzhkov for his senior debut, in search of a goal. QPR goalkeeper Ingram contributed to the win with some good saves, but will have done little to convince McClaren of a return to the first team. Baker's free-kick was accurate, with some pace, but not enough to excuse his spillage. Having barely featured since the early weeks of the season, as he contributed to an unconvincing, hapless QPR that have much improved since, he won't expect to be starting again in the league - but he can expect another opportunity in the next round of the FA Cup. Jack Bidwell was defensively sound and a thorn in Leeds defence going forward. Not only did he win the penalty from which QPR opened the scoring, but his second-half headed goal proved decisive in the end.